…you just never know when it’s going to be delivered! As a Brit living in Canada, my relationship with Cadburys has been “complicated”. I’ve written about the highs and lows before, in Dear Dairymilk, and the difficulty of accepting the flirtatious flavours of foreign pretenders, in It’s chocolate Jim, but not as we know it. But it’s true what they say – you never forget your first love. Nothing warms you like the love of good friends, who remember you despite their own troubles and the many miles between you. damn, i don’t like chocolate! I won’t comment on the Kraft Dinner, but seriously… did the Northern Ireland Tims taste different? It’s true! Milk only over there. So I became used to ordering lattes when (obviously not from Timmie’s) so that I didn’t miss the cream. Oh my goodness! The best milk chocolate in the universe!! 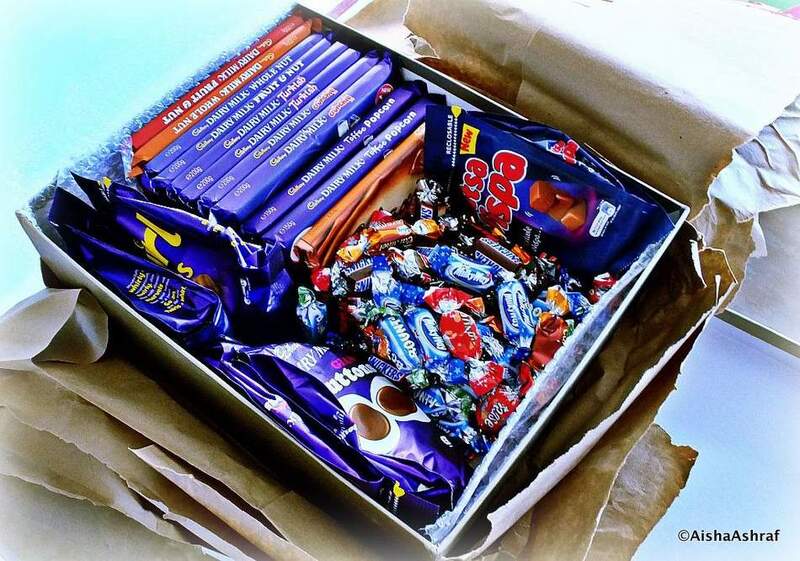 Actually looking at that photo made my mouth water… I don’t know why Cadbury’s don’t seem to export but it’s very hard to find in Jamaica too, and very pricey. 🙁 Having said that I actually prefer dark, dark chocolate. But…Cadbury’s IS special. Yay for you! Getting packages filled with favorite treats is always the best. It’s such a simple thing, but chocolate has a totally transporting taste, doesn’t it? Living in Northern Minnesota I used to love it when my family would go on a long weekend to Canada–it meant I could buy a Cadbury’s Crunchie from a gas station!! I LOVED those, so exotic to an American kid in the 1980’s. I never even realised it would be different to a UK Crunchie.